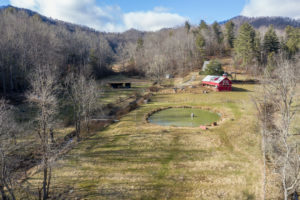 This new homestead listing in the Asheville area is truly designed for sustainable off-grid living if the power goes out, but at the same time providing fun and recreation in the meantime. The owners engaged Scott Hunt of Practical Preppers to design the systems within the property. This property has everything necessary for such living: abundant flowing surface water, stocked pond, orchards, garden areas, 120′ heated greenhouse, fenced pasture, fruit trees, end of the road privacy. As for the buildings and systems it offers geothermal heat in the Main House as well as a wood fired boiler for back up. The Main House has a 5kw solar system as well as rain catchment system and whole house generator and wood burning stove. There is a 3BR/2BA updated Farm House (offered fully furnished) along with a 1BR/1BA modern Guest Cabin (offered fully furnished) that generates nearly $50k rental income via VRBO and three tiny cabins (two of which are heated/cooled and one totally off-grid powered by a 4kw solar system). These three cabins share a common kitchen/bathhouse that is also totally off grid. A 100 year old barn has been updated and expanded to include finished heated space above. For recreation, you can hike the 20+ acres as well as the trail network on adjoining lands under conservation by the Southern Appalachian Highlands Conservancy. There’s a two-story framed treehouse with canopy walk leading to a 200′ zip line. The two creeks provide a place to swim and enjoy the cascading waterfall. No zoning restrictions mean you can hunt and shoot on the property if desired. This property truly has it all. Being offered as one single farm or in three configurations centered around the three primary dwellings. Call today for details or visit the website here.